Found guilty of capital murder for the deaths of his three children, Cameron Todd Willingham (Jack O'Connell) is sentenced to death by the state of Texas. 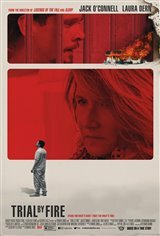 Years later he is visited by Elizabeth Gilbert (Laura Dern) who is convinced of his innocence after hearing his story and the case that was built against him. Sitting on death row, Elizabeth begins an uphill battle to fight for his freedom, questioning everything the state built their case upon including a suppression of evidence that could have proved his innocence. Elizabeth soon finds that it's not just Todd she's fighting for, but an inherently flawed and broken system that goes beyond him, but maintains hope throughout.